Entries: Allocation: 3 April. Closing: 3 June. A sunny, warm and pleasant summer's day greeted the 12 entrants to this year's One-Day AC Open Tournament, and a after a short knock-up play started on schedule. It was watched for a while by a large audience of joggers in the Cassiobury Park Saturday morning fun-run, which had located its finishing line right next to the courts. The courts were quite fast, by Watford standards anyway, and the hoops fairly unforgiving. In the Level Advanced 'A' Block three of the four the first round games went to the seeds, the exception being the young Mexican student from Cambridge, Cesar Miranda-Reyes, who showed some flair in beating Brian Havill. In the second round Cesar then repeated the performance to beat Gary Bennett and set up a final against the favourite Bryan Harral of Wrest Park, who had won a close second round game against Alan Clark. In the final the skill and control showed by Bryan proved too much for Cesar, and Bryan finished with a comfortable margin to take the title, leaving Cesar to take the consolation prize for the player amongst the others with the largest net index point gain. 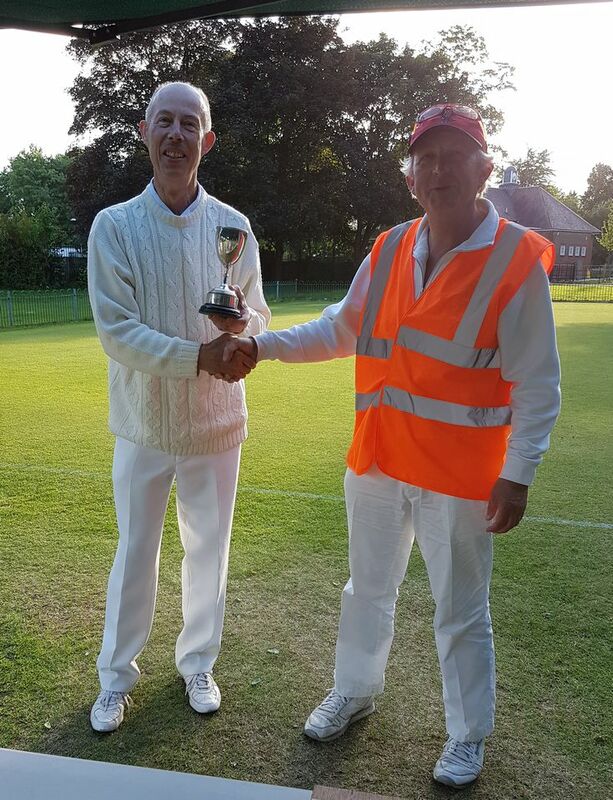 In the Handicap Advanced 'B' Block the fairly challenging conditions resulted in both games going to the 3-hour time limit, with John Street of Enfield and Roger Bowman of St. Albans emerging victorious. In the second round these two visitors then played each other with the win going to John Street, this time within the time limit, while in the other game between two local players John Bee emerged winning narrowly on time. So by the last round three of the four contestants still had a chance of winning the block. John Bee then managed to win against John Street, leaving both of them with 2/3 wins and both with one win within the time limit. So in the other game between Roger Bowman and Robin Barry, since Roger had not managed to win his first game within time he needed to peg out against Robin in order to tie with the other two. But unfortunately for Roger the clock defeated him and he was only able to win on time. This left the two Johns tied on both wins and wins within time. Since John Bee had beaten John Street in their individual encounter, John Bee emerged as the Block 'B' winner.